These canvas window awnings provide excellent shade in the summer, but should be taken down in the winter to extend the life of the fabric. Window Awnings are great at keeping the hot summer sun from turing up the heat on your house in the warmer months, but as soon as the pumpkins come out and the first frost of the season hits its time to take them down. Taking down awnings before winter hits can extend the life of the fabric as well as let in much needed natural light during the winter months when we see so little of the sun. Southern exposed windows with their awnings taken down. 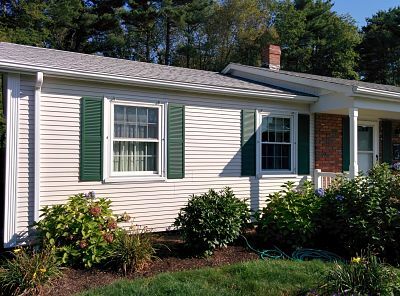 While the window awnings add a great look to this home, taking them down in the winter time is beneficial for the reasons listed above. The problem, unfortunately, is that someone has to actually take them down. The solution to this problem is only a phone call away as we will take down, and store your awnings for you, hassle free. A patio canopy is taken down for the winter, and only the metal frame remains. Call us when you want them down, and then again in the spring when you want them back up. 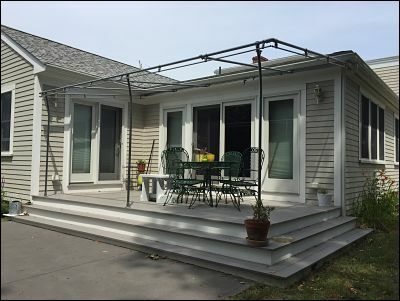 We service all awnings including windows, like the ones above, and larger patio canopies that cover a porch or deck. 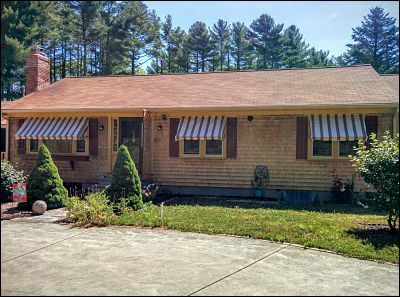 Give us a call today, 508-995-6333, and your awnings will be down without you having to lift a finger!